In this post I will talk about 5 shocking facts about Bakhtiyar Khilji. 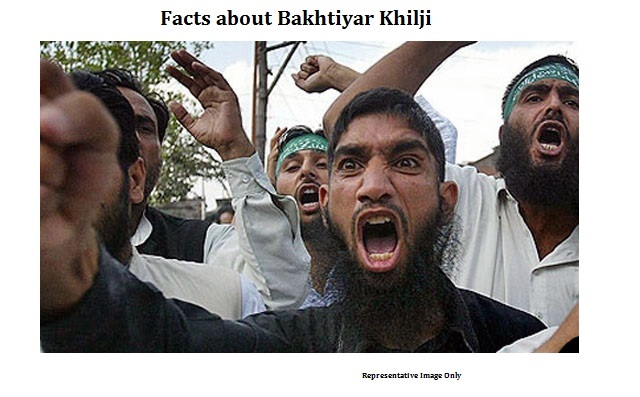 Bakhtiyar Khilji was a terrorist invader from Turkey in the 12th century. He was a genocidal maniac who killed thousands of indigenous Indians and an Islamic Jihadist who destroyed major places of education and worship of Hindus and Buddhist. Bakhtiyar Khilji was a killer and would have been called a war criminal in today's day and age. Below are 5 shocking facts about Bakhtiyar Khilji. 1. Bakhtiyar Khilji was a thief. He used to ravage and loot the open country to the east of Karmanasa and in the direction to the east of Bihar. 2. Bakhtiyar Khilji was a Jihadi terrorist who plundered Hindu territory over and over again..
3. Bakhtiyar Khilji destroyed Nalanda University and slaughtered all its Buddhist and Hindu Monks.
" made a sudden dash for fortress of Bihar (hisar-i-bihar) , captured it by forcing its postern-gate and put to the sword all its inhabitants, most of whom were shaven-headed monks possessing much wealth and more books." 4. Bakhtiyar Khilji ransacked Hindu villages, slaughtered its populace and looted valuables wherever he went. ... Shakya Shribhadra of Kashmir visited Magdha ... The traveller found Odantapuri-vihira and the Vikramashila monastery in ruins, and terrified by the excesses of the Turks in Magadha he fled for safety ..
5. Bakhtiyar Khilji is responsible for the decline of Buddhism in India. That's it. Thank you for reading 5 Shocking Facts about Bakhtiyar Khilji. Please show your appreciation by sharing and/or leaving a comment.